UAMS Otolaryngology-Head and Neck Surgery Department Chair John Dornhoffer, M.D., (left) recognizes Bruce Gantz, M.D., the Sharon and Ted Bailey, M.D., Distinguished Lecturer in Otology. March 22, 2019 | The inaugural Otolaryngology Diamond Conference provided a national meeting ground for the exchange of ideas, as invited speakers and UAMS faculty highlighted the latest research, clinical techniques and management practices vital to the practicing ear, nose and throat doctor. The March 8-9 conference attracted attendees from across Arkansas and the United States. The UAMS Department of Otolaryngology — Head and Neck Surgery welcomed 58 guests, including five UAMS alumni, to the conference, which was held in the Jackson T. Stephens Spine & Neurosciences Institute. Attendees heard from guest lecturers and UAMS faculty on the latest updates in otology (the study of the ear), head and neck surgery, and pediatric otolaryngology (ear, nose and throat). Conference exhibitors displayed the newest technologies for complex facial reconstructions, surgeries through the nose, hearing restoration and more. Conference Co-Director Brendan C. Stack Jr., M.D., welcomes attendees. In welcoming guests to the event, department Chair John Dornhoffer, M.D., said he hoped the atmosphere would be fairly informal and that it would be easy to ask questions — all in the name of encouraging open discussion. Dornhoffer co-directed the course with Brendan C. Stack Jr., M.D., a UAMS professor with a special interest in the thyroid and parathyroid. 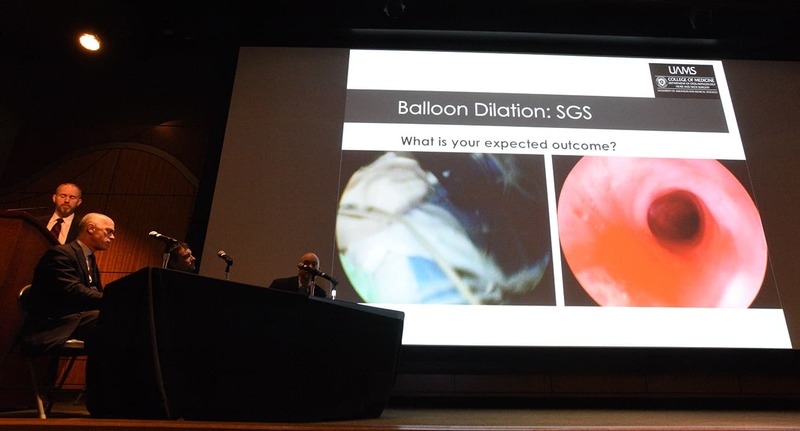 Gantz spoke on the increasing evidence for preserving a patient’s residual hearing during cochlear implant surgery.Bruce Gantz, M.D., gave the invited guest lecture on otology, named in honor of longtime UAMS benefactors Sharon and the late Ted Bailey, M.D. Cochlear implants are surgically implanted devices that replace lost hearing function in the ear. However, the brain has to learn how to interpret the new information from the implant and translate it into understandable sounds and speech. If the patient has some residual hearing, the brain has to reconcile the natural hearing ability with the information provided by the implant. Inserting the devices can destroy the patient’s natural hearing, so Gantz showed his techniques for preserving hearing where possible. He also showed an experimental motorized insertion technique developed by a colleague that performs the insertion more slowly and steadily than is possible with the human hand, minimizing damage. For many patients, their residual hearing remains in low frequencies. Gantz showed a variety of studies that indicate that the better patients are able to hear in the low frequencies, the better they are at distinguishing human speech when there’s background noise. Understanding speech during background noise is one of the chief complaints among patients who are unsatisfied with hearing aids and cochlear implants alike. Gantz also cited evidence that the brain’s ability to react to change is key in an individual patient’s success with their cochlear implant. Otologists know that not every patient has the same success with cochlear implants. More and more evidence points to the brain’s neuroplasticity, or ability to adapt, as playing a role in this process. Gantz said he thinks these lessons are especially important given that hearing loss is so common among the aging, and because there is increasing evidence that those who do not hear well lose their social connections and are more likely to develop dementia. He envisions a future where cochlear implants are more common for more types of hearing loss. Eric J. Lentsch, M.D., gives the invited lecture during the head and neck portion of the conference. 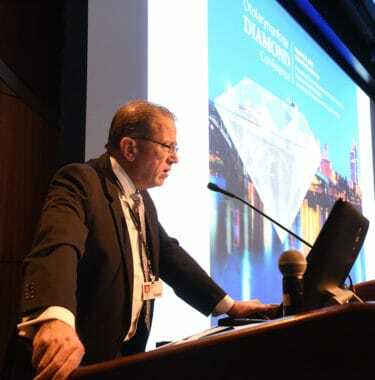 In the head and neck surgery section of the conference, Eric J. Lentsch, M.D., of the Medical University of South Carolina, gave summaries of the academy updates for treating head and neck melanomas and aggressive non-melanoma skin cancers. Lentsch’s talk paved the way for discussion on several points, and Stack was able to tell the group of a recent international, multi-center study that took place partially at UAMS that may alter these recommendations. Stack was a co-investigator on the study, which was published Feb. 15 in the Journal of Clinical Oncology. “Our study showed that when a patient has negative nodes on a PET/CT scan, 96 percent of the time the result is truly negative. 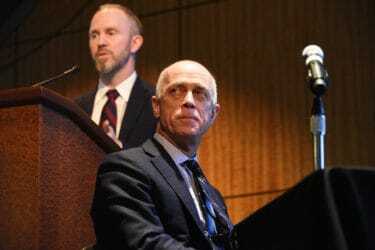 With a high level of confidence, we can say to a patient that if your neck is negative on PET/CT, there is probably no need for a neck dissection,” Stack said. Neck dissections include an incision across the neck to remove the lymph nodes. If the study results in a change to the treatment recommendation, about 21 percent of head and neck cancer patients could be spared from this invasive extra step. 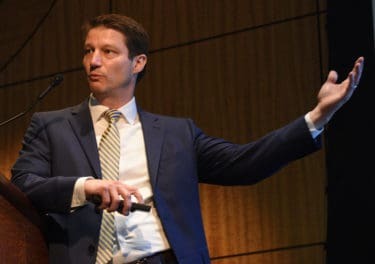 Likewise, discussion was spawned by a presentation by UAMS Professor Emre Vural, M.D., on trans oral robotic surgery, based on his personal experience with the technology and the latest research. During the Q&A, Vural and Lentsch discussed the relative advantages of using the robotic technique or a different, laser-based system. Both have their pros and cons, and Gantz weighed in and said that he has found the robotic system to be more cost-effective. The information exchange continued Friday evening with an informal reception at the 1836 Club in downtown Little Rock and resumed Saturday with the pediatric section. Gresham Richter, M.D., of UAMS/Arkansas Children’s Hospital, left, introduces the invited lecturer in pediatrics, Ellis Arjmand, M.D., Ph.D.
Ellis Arjmand, M.D., Ph.D., of the Children’s Hospital of New Orleans, shifted gears from the clinical to the managerial and offered talks on peer review and why it matters in managing physicians; understanding the process behind erroneous decisions and how we can fall victim to our own psychology; and quality management and quality improvement in health care. Arjmand said the medical industry has been left to largely self-regulate, with varying degrees of success. He argued that self-regulation is the best route, but it needs to be robust. UAMS’ Gresham Richter, M.D., who practices at Arkansas Children’s Hospital, gave an update on the treatment of pediatric vascular malformations, including infantile hemangiomas, capillary malformations, venous malformations, arteriovenous malformations and lymphatic malformations. In general, Richter said he has found that the conditions respond best to multi-modal, targeted approaches, and for the more aggressive forms, earlier interventions are beneficial. Each lecture included a Q&A portion, and each section included a panel discussion to encourage open dialogue at the conference. Judyann Krenning, M.D., of Phelps Health Medical Group in Missouri, said the conference was very informative, with plenty of information that will have direct application to her practice. Although she may not perform some of the specific surgeries covered, she needs to understand the decision-making process around their care because she routinely sees these patients to manage their after-surgery care. UAMS otolaryngology resident James S. Russell, M.D., said he was thankful for the topics covered. He said he could apply the medical information to his training, and the managerial topics gave him a better sense of what it will be like for him when he goes into practice. Dornhoffer said the idea for the conference came from the Magnolia Conference, which is hosted by the University of South Carolina at Charleston. Dornhoffer was a guest speaker in 2018. Lentsch, who is from the University of South Carolina, said he was glad to see the conference model was appreciated enough to warrant emulation and thankful to receive the invitation to speak. “I think, especially for a first year event, this is spectacular,” Lentsch said.